Nothing beats a hearty, slow-cooked casserole during the chilly winter months. 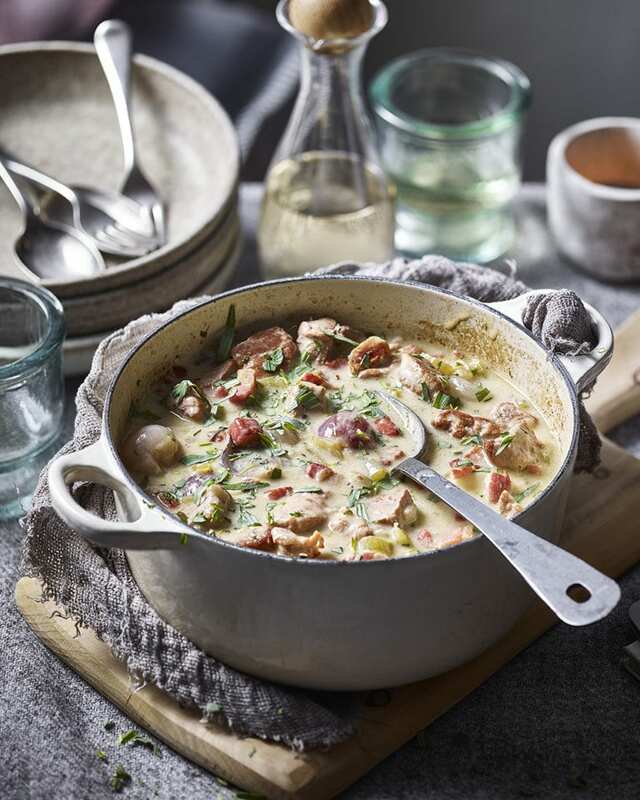 We vow our pork and cider recipe will not only fill you with warmth but it will also fill your home with a wonderful fragrance as it cooks too. Heat a glug of oil in a large pan. Add the pork in 2-3 batches and brown for 6-8 minutes per batch, transferring with a slotted spoon to a plate. Add the whole shallots and cook for 2-3 minutes until browned, then transfer to a plate. Meanwhile, fry the bacon in a large flameproof casserole with a splash of oil for 4-5 minutes until crisp, then scoop out with a slotted spoon and set aside. Put the onion and celery in the casserole with the butter, then cook for 6-8 minutes over a medium-high heat until softened. Add the pork, bacon, 300ml cider and stock, bring to the boil, then turn down the heat. Partially cover the casserole, then simmer gently for 1 hour. Add the shallots, then cook for another 1-1½ hours until the pork is tender (see make ahead). Mix the cornflour in a small bowl with the 1 tbsp cider, add to the casserole and cook for 5 minutes, stirring, to thicken the sauce. Stir in the crème fraîche, mustard and most of the tarragon, then season and add a splash more cider. Serve scattered with the remaining tarragon with crusty bread and potatoes or rice. Cook to the end of step 3, then cool, cover and chill for up to 3 days or freeze for up to 3 months. Defrost, then reheat on the hob and continue. A dry bottled cider is top pick – or an appley chenin blanc white wine.